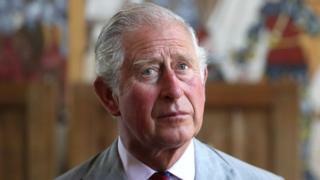 Prince Charles is launching a major research initiative with the University of Cambridge, addressing the challenges of a time "full of uncertainty". Businesses and academics are being brought together to address the "most pressing" global challenges, in fields such as health and the environment. The scheme will create 12 new research fellowships at Cambridge with £3.6m in funding from partners in industry. "Objective research" is needed now more than ever, says the Prince of Wales. These Prince of Wales Global Sustainability Fellowships will focus on major global problems, linked to United Nations' sustainable development goals. These targets were set by world leaders in 2015 as a roadmap to tackle poverty and to reduce environmental damage, but this week the UN warned that they have already been blown off course by "drought and disasters" and "surging conflicts". "In a world full of uncertainty, we do need, more than ever, the best and most objective research that universities can provide," the Prince of Wales is expected to say, when the scheme is launched on Wednesday. "The idea of pooling the resources of leading academics and industry colleagues to research solutions to some of the most demanding global problems is long overdue," he will say. The fellowships also mark the year in which Prince Charles will become 70 - and he says he is "most touched" and "enormously grateful" by the project being launched under his name. Jake Reynolds, executive director of the University of Cambridge Institute for Sustainability Leadership, says the research will address the issues which are "not easy to push into the long grass". This will include ways of limiting industrial damage to the environment, improving sustainable approaches, reducing carbon emissions, managing water supplies and developing economies that are more socially inclusive. The link between business and the university is intended to "make sure there's a practical outcome" and to "focus on real-world challenges," says Dr Reynolds. "We want to build it up as a flagship," he says. There will be an initial 12 fellows, from anywhere in the world, who will each tackle a specific sustainable development issue - with the expectation of more fellows being created. Among the businesses supporting the scheme are Unilever, Sainsbury's, Astra Zeneca, Anglian Water and the Equal Opportunities Foundation. Unilever chief executive, Paul Polman, said firms needed academic expertise to improve sustainability and to "design better ways to do business". Stephen Toope, vice-chancellor of the University of Cambridge, said the outcomes would be "relevant and purposeful". The creation of the fellowships, and the link between university and industry, would be for "society's benefit," in the UK and globally, said the vice-chancellor.